GF Piping Systems has introduced the second generation Type 530 AquaTap Recirculating Faucet with new functionality for greater performance and improved control. The AquaTap faucet features a proven patented flow through head design and patent-pending Inline Flow Diverter (IFD) technology that eliminates dead-legs and optimizes flow characteristics. These design features ensure pure water for laboratory dispensing in a variety of UPW applications. Adding to its already unique-to-market flow performance, the newly enhanced faucet has been re-designed with a more contemporary style handle that produces a full 120 degrees turn from closed to full open position, while providing a reassuring tactile feel of valve position. The new handle also identifies the type of liquid or gas media being dispensed using symbols and color codes in accordance to SEFA recommended Practice No. 7 for hospital and laboratory fixtures. The AquaTap valve comes standard with a ¼” FNPT connection with barbed outlet, which is designed to adapt to full flow aerators and other tube fittings for feeding common laboratory tools. The package also includes two PROGEF Natural PP isolation ball valves for easy faucet removal. These valves isolate flow to the faucet to allow for maintenance or renovation without interruption to the main water system. Other outstanding performance characteristics include unparalleled flow rate of up to 5 (GPM) through the faucet, with no more than 1.5 (PSI) pressure drop across the main UPW loop – a virtually negligible amount. Three Aqua-Tap Faucets can be served from a single IFD. 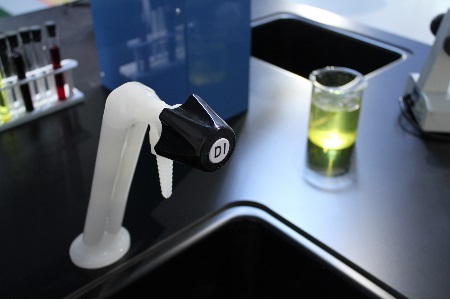 The faucet is available in SYGEFPVDF, while accessory products, including the IFD, are available in SYGEF PVDF (polyvinylidene fluoride), PROGEF Natural PP (polypropylene), and PROGEF Standard PP (polypropylene). All three materials offer excellent chemical resistant properties and high impact strength. GF Piping Systems supplies a full range of plastic pipe, fittings, valves, actuators, rotameters, fusion machines, secondary containment, heat exchangers, custom products, and sensors and instrumentation for industrial process control. For more information, visit www.gfps.com.